This was made by Thomas Zagrosek after some discussion with Stefan Szczelkun in 2007. It was first played at a party at the Half Moon, Herne Hill South London on 3rd February 2008 to launch the Agit Disco label. 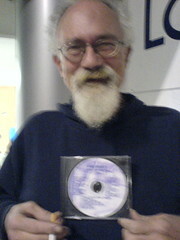 Soon afterwards I met the poet John Sinclair at the London Printworkshop in West London and gave him a copy of Agit Disco 1. Sinclair was manager of the MC5 in Detroit 1966 – 69 and was a White Panther leader in the same period. People used to often whistle in the street when I was a boy. Earlier the social world was literally full of songs being sung at any opportunity. We have been silenced and we just have just no idea at all of the extent of our loss. This story gave me a brief and fragmented insight into the range and power the collective human voice can still have. Somewhere between these two is what Roland Barthes called the third or obtuse level of meaning. This exists in the space between the literal meaning of words and the musical meanings that may be evoked by the grain of our voices.